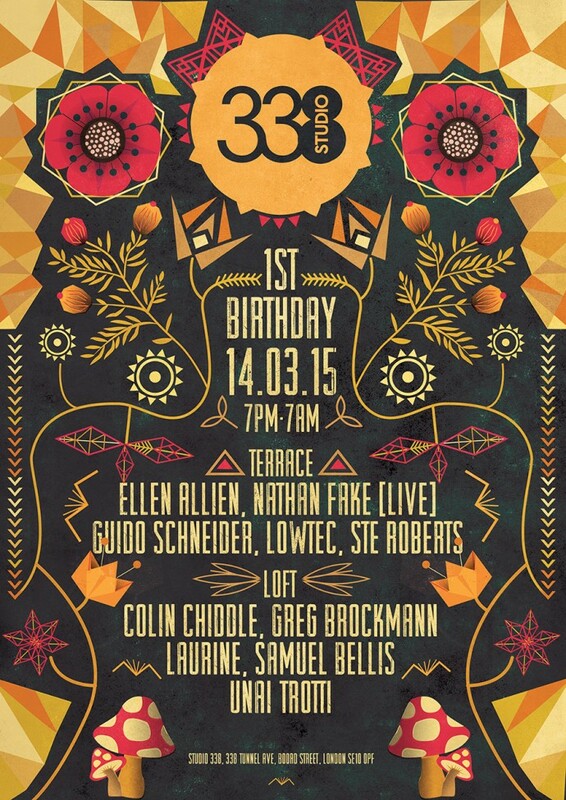 You are here: Home / events / London’s Studio 338 -1st Birthday- with Ellen Allien, Nathan Fake, Guido Schneider…& More! It’s amazing to know that the forward thinking Studio 338 has now been redefining terrace clubbing in London for a full year. To celebrate what has been an impressive 12 months by anyone’s standards, there will be a very special event on Saturday March 14th with a bold and exciting line up that features BPitch Control boss Ellen Allien, Border Community man Nathan Fake (playing live) and Workshop boss Lowtec all lining up. Studio 338 has thoroughly put South London clubbing back on the map with its vast outdoor and covered terrace, living indoor forest and no expense spared production. Every weekend London’s discerning beat disciples have been treated to roadblock parties, serving up underground house, authentic techno and cutting edge bass music in fine style. As well as hosting boutique festivals in 338’s car park and a hugely successful charity event in aid of Kids Company, the venue has hosted DJs and brands including the likes of Eastern Electrics, Magna Carta, Sankeys, Abode, Krankbrother, Half Baked, Tiefschwarz, Apollonia, Cassy, RPR Soundsystem, and parties with Mixmag, Cocoon and We Are FSTVL. And so to the birthday line up: Ellen Allien is a Berlin legend. She was born there and has lived there all her life, and has managed to cultivate a whole sound and scene around her very specific taste in art, fashion and music. As a producer she has released countless seminal full lengths that range from dark pop to techno, new wave to minimal always with a rare sense of personality. As a DJ, Ellen is someone who draws on her years in the game, someone who pilots more unpredictable DJ sets than your average newcomer. Testament to her skill is the fact that she has been tapped up for a plethora of official mix CD series from fabric 34 (recorded on vinyl in one single live take) to Watergate 05 via Boogybytes Vol.04 on her own BPitch. Marking another brave and ambitious booking is next headliner Nathan Fake. The exciting Englishman is a seminal sonic dreamer who has long been a key part of the Border Community family. His tracks – such as the modern classic The Sky Was Pink – are ambient, atmospheric jewels married to supple grooves that really get under your skin and as a live performer he aims to do exactly the same, so expect very special things from him on the night. Lastly, Lowtec is the man behind the much loved underground house and techno label Worksop. His own ragged and analogue music ranges from slow mo and experimental to deep and Detroit inspired, whilst his famous label has made stars of the likes of Kassem Mosse. He also releases his self declared “odd music” on Boddika’s Non Plus, Laid and Brainmath and as a DJ has decades of experience to draw on. This party will run from 9pm until 7am and will make perfect use of the space, so be sure to come down and celebrate one of London’s nocturnal gems with a happy crew of like minded music lovers. Good Times at Notting Hill.